For those requiring a help in the vertical mobility department a wheelchair platform lift, a stair lift and a residential elevator are your basic options. The best alternative to any of those options is simply to live on one level, but that isn’t always possible. Even where it is, sometimes economics rules in favor of the various lifts. While none are cheap, they might be cheaper than building out or moving. First, let us define our terms. 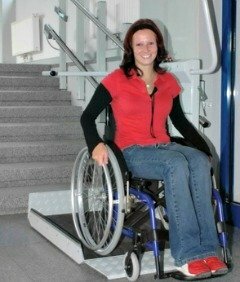 Wheelchair platform lift - a lift, either vertical or inclined, that is designed to take a wheelchair from one level to another by having the wheelchair roll onto a platform. 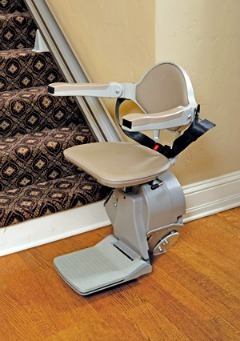 Stair lift - A seat attached to a rail that moves alongside a staircase. Great for people, not so good for things, like wheelchairs. Residential Elevator - Just like the ones you find in skyscrapers, but they are smaller, slower and cheaper. These the three basic options that we will consider, starting with the elevator. Thomas Jefferson got the whole ball rolling with his invention of the dumbwaiter. The dumb waiter was like an elevator for things. In his case food and dirty dishes. It wasn’t so much a labor saving device as a novelty that offered a dinner meal free of servants listening in on the dinner conversation. It was the aesthetics that drove the invention, not the cost of labor. The meals were loaded onto the dumbwaiter from the level below. The dumbwaiter was manually hoisted, but pulleys and a counter-balancing weight made the job easy. In the dining room Jefferson could open up a cabinet and pull out the food. A little later he would open up the cabinet and more food would appear. The idea of a dumbwaiter caught on as a practical means of getting stuff from a ground floor to an upper floor. When I was young we lived in a townhouse in Belgium that had a dumbwaiter. It was a skinny but very tall house, so the dumbwaiter was very practical. When buildings started growing tall that practicality became critical. You might ask someone to climb up 6 flights of stairs, but 25? 100? Elevators made this possible. With their introduction to skyscrapers the need for safety grew. These elevators would take thousands of people up hundreds of feet every day. They had to be reliable, but also safe. The residential elevator was mostly a novelty that only the very wealthy could afford. Since most people lived in two story houses there wasn’t a big push to include elevators as a regular household appliance. While it is still likely to remain a novelty they are becoming more common. As our society ages we have more and more people who find that they can no longer make the long trek up the stairs. An elevator is a reasonably good option under the right conditions. For one thing the structure of the house has to be able to accommodate an elevator shaft. For a lot of homes this simply won’t work. However, a lot of newer homes have open atriums, and where you have that kind of open space between the floors you can sometimes squeeze in an elevator. Still, it is easiest to work an elevator into a house if the house is designed with an elevator in mind. The home of Mark Leder and Rosemarie Rossetti is one such house. They have an elevator made by Garaventa Lift that runs from the basement to a second-story. It has doors on either side and can handle more than one wheelchair at a time. Clear accordion doors keep the occupants safe from contact with the elevator shaft. I can attest that it runs quiet but slow. They run a business out of their home, and it made much better sense to install an elevator than a platform lift. Many people entering their home would be using wheelchairs and the ability to handle more than one at a time was worth the space and cost. 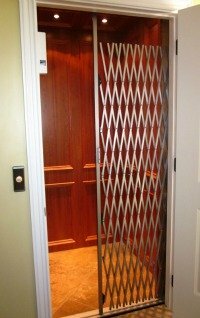 Residential elevators can seem rather industrial, but there are plenty of options available. The elevator doors and the elevator itself can be decorated to match the home. They don’t have to cold and sterile and mechanical. For instance, Dayton Elevators offers elevator cabins in a variety of wood finishes, while Garaventa offers glass cabs, as well as wood. Whether you are looking for modern or traditional the elevators can be designed to fit into your home’s decor. Elevators start at about $10,000. For that you will get the most basic of elevators running between two floors, and of a type that operates without a shaft. It is just a cab attached to a track that is secured to a wall. The cab goes through a hole in the floor above. When the elevator descends the hole is automatically covered up. This is sometimes called a vanishing floor. Since it lacks a shaft it requires sensors below and above to make sure that nothing or no one is in the path of the elevator. No pit below the elevator is required, but a hole in the second-story floor will have to be constructed. This type usually is limited to about 500 lbs of capacity. From that most basic of elevators you will find a variety of options of drive and load limits. Most of your options will require an elevator shaft and a pit below the elevator, and some extra clearance above the elevator. All this means money. The average residential elevator will probably run in the $15,000 to $20,000 range, but costs will heavily depend upon the modifications necessary to the structure of your home. With any elevator there will be some on going maintenance expenses. If you get a system that involves cable then you can expect to replace the cables every five years. Whatever system you choose you will be getting safety features that have been improved and perfected based on decades of use in skyscrapers. The skyscraper owners have essentially paid for the research and development that will go into your elevator system. Click here for more details focusing on home elevators. The cheapest way to add mechanical access to your upper floors is with a stair lift. These are often times the best solution for a retrofit into an existing structure. They have been designed to run alongside an existing stair. Usually they are bolted to the stairs rather than to the wall. When not in use the chairs typically fold out of the way so that the device is not an incumbrence to traffic on the stairs. A stair lift is a good option if the person can walk. The person simply sits in the chair and the chair glides up a track that runs along the wall of the stairs. It is a great way to save the knees. This option isn’t so great if the person is in a wheelchair. The person has to transfer to the chair and then transfer back to the wheelchair. This means they either are dragging the wheelchair along with them or they have a second one at the top of the stairs. The systems can be designed to curve with the stairs, so tiered stairs with landings is not a problem. Of the three options presented - residential elevators, wheelchair platform lifts and stair lifts the latter is the cheapest, so for many people this is the best option. The prices for new systems start at around $1,500. Used systems are readily available for half that price. Since there is little to no structural improvements that need to be made installation costs are generally low. Since the stair lift will be added to the side of your existing staircase it doesn’t present a large structural change to your house the way an elevator does. If you love your house and have grown accustomed to it, making major structural changes may not be something that you want to do. In this case a stairlift will allow you to stay in the house you love without making big changes that will make it seem strange and different. A stairlift is great for some people, but what about those who rely on a wheelchair for mobility? 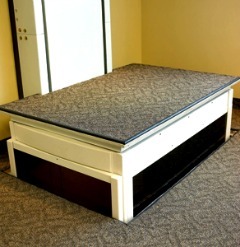 A wheelchair platform lift is probably the best option for most people. It comes in two flavors. There are inclined wheelchair platform lifts and there are vertical wheelchair platform lifts. An inclined wheelchair platform lift is basically a stair lift that has a platform rather than a chair or in addition to a chair. You roll onto the platform and then the stair glide takes you up to the next floor. Since it has to accommodate a platform it has to be beefier than a stair lift and the platform is going to take up a lot more space than the chair. No getting around it, a wheelchair platform lift will be substantially more intrusive than a stair lift. An inclined wheelchair platform lift will require a staircase at least 36 inches wide, but some systems may require a wider staircase. The benefit is that you can roll right on and right off, without transferring to a seat. The alternative to the inclined platform lift is the vertical platform lift. This is a little like an elevator. The platform goes straight up. Sometimes the platform has something like a scissor lift underneath. It will probably have a cage around the platform, but it is does not have a completely enclosed space like an elevator and it is not in an elevator shaft. While a vertical wheelchair platform lift is great for getting from one floor to the next they really shine when there is only a drop of a few feet. Sometimes these shorter units are called porch lifts. They are perfect for porches and for split-level homes or dropping down into conversation pit areas or similar small elevation changes. In this case the economics is mostly a matter of the comparison with the cost of installing a ramp. A very long ramp, or a ramp that has to curve around may take up too much space, so the costs involved may not be so much a matter of cash paid but the hidden cost of space that is no longer available for its original use. To install a platform lift you are going to face some of the same issues as with an elevator. If you have an open atrium you might be able to install one without having to affect the structure of the house, but otherwise you will probably need to create the open space and this means major structural changes. The benefit over the elevator is primarily cost. In most cases you will be saving money. The downsides are aesthetics and safety. A vertical platform lift is exposed machinery. It may look industrial. Since it is not an enclosed box you could also run the risk of something getting caught between the ascending platform and the surrounding structure. Protections can be put in place, but it is just not as protected as an elevator with its enclosed shaft. You can probably get into a vertical wheelchair platform lift for about $10,000 plus the cost of the alterations of the house. 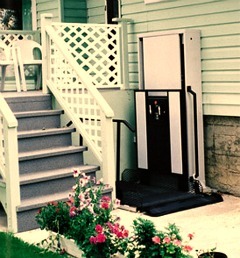 If your need is more in-line with a porch lift then the system will cost considerably less.